SEBLOD Updater is the secure method to keep your SEBLOD plugins, templates, add-ons and other extensions up-to-date. Please ensure that you have SEBLOD installed before installing the SEBLOD Updater add-on. Head to the SEBLOD Updater Add-on download page and download the SEBLOD Updater add-on and install it through the Joomla! extension manager. The Updater add-on will then appear as a sub-menu item under Extensions > SEBLOD > Updater. In order to associate your permissions to update various SEBLOD extensions, we require a connection between your SEBLOD.com account, and your website. To do this, we require you to enter a “secret key” that you can obtain from SEBLOD.com in the SEBLOD Updater Options. Retrieve your key by logging in to SEBLOD.com, and going to the “edit profile” page. 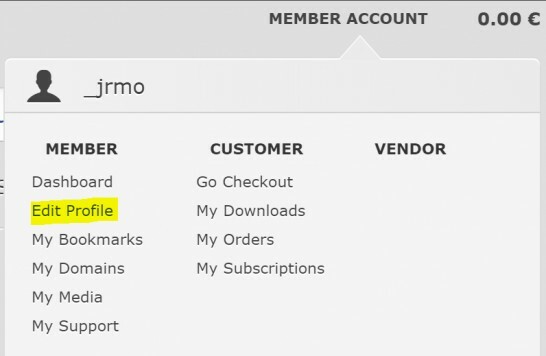 This can be found by hovering over the “Member account” link in the top right hand corner of the webpage (for logged in users), and clicking “Edit Profile” in the hover menu. Your secret key can then be found by scrolling down slightly on the Edit Profile page. Copy the value that appears. Return to your website, and open the SEBLOD Updater options by going to Components > SEBLOD > Updater and clicking “Options”, or accessing them through the Joomla Global Configuration menu. In the “Secret Key” field, paste the value you retrieved from your SEBLOD.com account and click “Save”. As an additional safety measure, we also require that you add your site’s domain name to SEBLOD.com. To add your domain, log in to SEBLOD.com, and go to the “my domains” page. 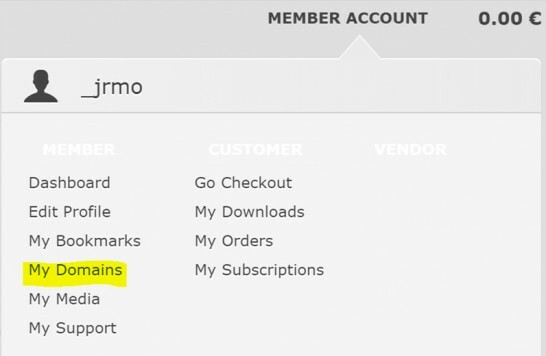 This can be found by hovering over the “Member account” link in the top right hand corner of the webpage (for logged in users), and clicking “My Domains” in the hover menu. Then, click on the green “+” button on the right hand side. In the field on the next page, add your site’s domain name. Please ensure that you do not prefix http:// or https:// before and that you add both www. and non-www. versions of your domain. When you have typed your domain name, click the green checkmark. Great! Your site is now ready to use SEBLOD Updater. SEBLOD Updater uses Joomla’s update manager to find available updates. So, follow the same method to check for updates for SEBLOD extensions that you would for other Joomla extensions. Please note that these items cannot be updated directly from the Joomla Updater, it is simply required to populate the list of available updates. To update, you must now switch to SEBLOD Updater, where you will see the populated list of available updates. 4. You installed a SEBLOD application which contained a number of extensions which are registering updates, but you have not downloaded them individually on SEBLOD.com. This is currently a limitation in SEBLOD Updater. In order to be eligible to update an extension from SEBLOD.com, you must individually downloaded it by going through the checkout process. This creates an entry in our database that is checked to ensure you have the correct permission to use this extension. When you install an application, you are installing a package, but you do not have the individual extensions contained in the package associated with your SEBLOD.com account. This is a limitation that we are working on resolving soon.